The pieces were in place. It was just a matter of getting the job done. 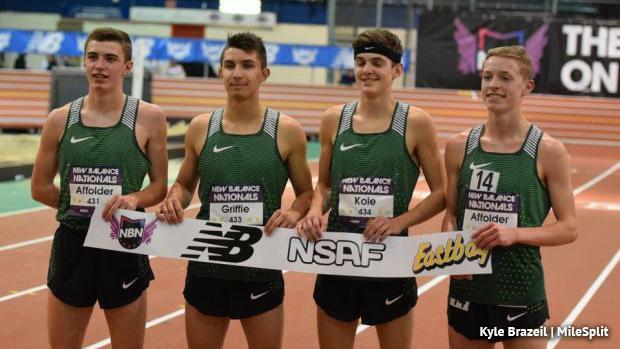 The Thundering Herd from Carlisle did just that at New Balance Nationals Indoor last winter. The quartet of Sam Affolder, Isaac Kole, Jared Griffie, and Noah Affolder ran 9:56.18 to set the national high school record in the distance medley relay. The previous record was set in 2000 by Gloucester in Massachusetts at 9:59.94. The transfer of the Affolder brothers, Sam and Noah, left a big impact and helped Carlisle take down the 17-year-old mark. Sam Affolder started things off on the 1,200 meter leg, splitting 3:02.11. He handed off to the 400 meter leg Jared Griffie in first place. Griffie maintained that lead after a 51.71 split and got the baton to 800 meter leg Isaac Kole. Kole, who would later go on to win at PIAA outdoor state title in the 1,600 meters in the spring, briefly lost the lead, but took it back before handing off to Noah Affolder in the lead. Kole split 1:57.41 and the baton was in the hands of the Pennsylvania state record holder in the mile for the final 1,600 meter leg. Affolder brought it home in 4:04.95 to give Carlisle the national title and the national record. Sam Affolder returns this weekend to The Armory with his new team, Loudoun Valley in Virginia. He'll be anchoring his squad's DMR on Friday night. Loudoun Valley has already run 10:02.58 this at the VA Showcase and were rather uncontested in doing so. Can the younger Affolder break his own record with a new team? That remains to be seen. For now, we remember Carlisle's terrific 2017 relay.